This is a Digital Google Forms of our Comparing Fractions Task Cards. 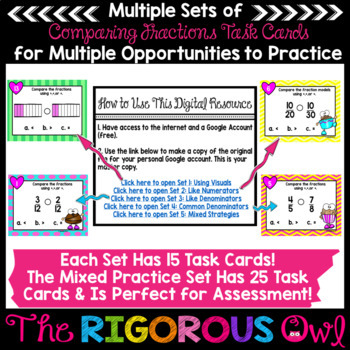 When students complete our Digital Google Forms Comparing Fractions Task Cards they will use different strategies to compare fractions. 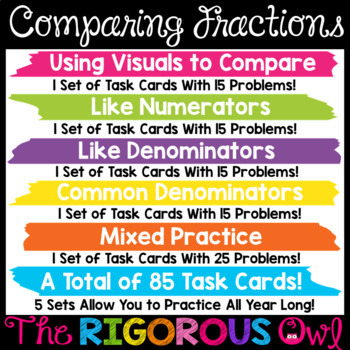 The strategies used to compare fractions are using visuals, using like numerators, using like denominators, and using common denominators. Students love our fun and engaging themed task cards and students love going digital! 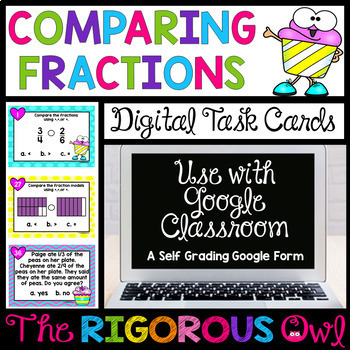 This Digital Google Forms resource includes 5 sets of self-grading Comparing Fractions Task Cards for your students to complete in Google Classroom. The sets include practicing using the comparing fractions strategies in isolation and then mixed strategy practice. This allows you to easily see which strategies your students grasp or which strategies they may need more practice with...genius! ★ I want to go digital, but I don't know where to start? Check out our blog post on how to upload digital products to Google. In this resource, we also include steps on how to upload a digital resource in 3 formats( written steps, steps in pictures, and a video tutorial) to meet your needs. Easy-peesy! We promise! This is the easiest way to get started going digital. ★ I want to go digital, but my class is not 1:1. What can I do? Guess what? We are not 1:1 either! We do not let that stop us from providing our students with a wonderful digital learning experience. We need our students to be computer savvy and ready for the state test. At first we only had 4 to 5 computers in the corner of our rooms, and that was okay. We used our digital task cards as one of our rotations and it worked out fine. Then we got tablets and we were 1:2, so we taught half our class and the other half was on the tablets. Then we switch. Genius and life-changing for us as teachers. We would never want to go back to life before digital. Digital is the way of the future. 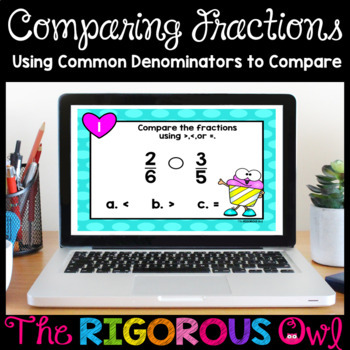 Need other resources for teaching Comparing Fractions? BE SURE TO FOLLOW US BY CLICKING THE GREEN STAR ABOVE TO BE NOTIFIED WHEN WE POST A NEW PRODUCT! ALL OF OUR NEW PRODUCTS ARE 50% OFF FOR THE FIRST 48 HOURS!!!! BE SURE TO LEAVE FEEDBACK TO RECEIVE TPT CREDIT TOWARDS YOUR NEXT PURCHASE! Don't miss out on updates, freebies, and tons of fun! This pack is intended for ONE CLASSROOM TEACHER to use. If you would like to share with your colleagues, please purchase an additional license. Thank you for respecting our hard work!